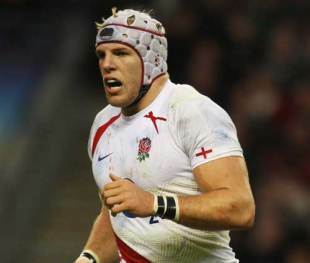 Stade Francais boss Ewen McKenzie has stated his desire to help flanker James Haskell and lock Tom Palmer regain their places in the England squad. Haskell and Palmer agreed moves to the Top 14 last season, leaving Wasps along with centre Riki Flutey - now at Brive. Of the three, Flutey is the only player to have been retained in Martin Johnson's Elite Player Squad (EPS), a situation that McKenzie is keen to remedy. "I've got a good line of communication with Martin Johnson," he said. "And one of the things I want to do is help these guys re-emerge into international footy. "I'm there for them, I'm looking at their skill-sets, the skill-sets Martin Johnson wants, what England are looking for and maybe we can dovetail them and give the boys an opportunity to play their way back in." The duo have been joined in international exile by a number of players, including Toulon's Tom May and Brive's Jamie Noon and Andy Goode. Toulon recruit Jonny Wilkinson has been retained by Johnson however, and is set to go up against Haskell and Palmer in Friday's opening fixture at the Stade Mayol. McKenzie is keen to see the players on the same side soon, maintaining that their French defection has not turned them in to bad players overnight. "England in a way are spoilt for choice," he said. "There is always going to be competition for places and in the end it comes down to opinion. It certainly doesn't mean they are bad players by any stretch. "Tom Palmer's been injured for a while and hasn't had a chance to press his claims and James Haskell is in a very competitive position. The back row is always competitive, with lots of options." McKenzie has already praised the impact made by his new recruits, with Haskell and England Sevens star Ollie Phillips having impressed in early-season testing. "They've fitted in very well," he said. "It's been good for them and they've brought some different ideas. We have a bit of a mixture of cultures. It's good to have guys who want to contribute and watch and have ideas, I like that. "They have been impressive physically - Haskell and Phillips have led everything in terms of conditioning."